Saniplant Biotechnological Research and Development Ltd. Novel microbial soil inoculant preparations are developed to be used on lands severely exposed to abiotic stress. Soil-living microorganisms are isolated, selected and characterised for properties potentially favourable in such stressed soils (Figure 1.). Primer targets for amelioration are low fertility lands unfit for agricultural activity due to deterioration (secondary salinized, alkaline-saline, acidic and drought-stricken sandy soils). Research is supported by grants form the Kozma programme (TUDAS_06-SANI0609). The soil microbial strain collection in the property of the enterprise is continuously under market-oriented development. Isolation of highly effective species and strains of soil-living microorganisms hitherto not used in commercially available soil inoculant preparations and research on specific microbial mechanisms, metabolic activities and tolerance against abiotic stress factors in soil bacteria are finanicaly supported by grants from the Kozma programme (TUDAS_06-SANI0609). New and innovative solutions include the development of a complex product containing the combination of soil bacteria and mycorrhizal fungi to be used in field cultivation and forestry. The mycorrhiza – a symbiotic association between the plant root and fungal hyphae – improves the host plant's nutrient uptake (P, N, Zn, Cu, etc.) and tolerance against drought, potential heavy-metal contamination of the soil and stress factors affecting engrafted plants. Research is financially supported by grants from the Jedlik Programme (SANI2007). 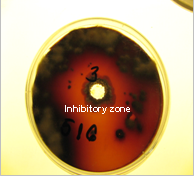 R&D activity involves the research and production of soil microbial preparations having a biocontrolling effect by inhibiting the growth of soil-living plant pathogen fungi (Phytophthora, Rhizoctonia, Pythium, Fusarium, Verticillium) (Figure 2.). Such innovative and environmentally friendly plant protection solution is highly sought for in both field cultivation of plants and forestry (seed grain production, forest nurseries, nursery gardens). We are developing a micro- and molecular biology based soil diagnostic system for the field efficiency testing and trademark protection of our commercially available and yet to be developed soil inoculant preparations. 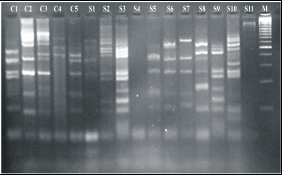 With the use of maps and fingerprints of specific polymorph regions of the DNA of selected strains it is possible to identifiy own-developed strains (Figure 3.) and to evaluate colonization dynamics in inoculated soil and the rooting zone. The project is financially supported by grants from the Kozma programme (TUDAS-06-SANI0609). Our aim is to introduce a new technological method in the production of soil bacterial preparations (Figure 4.). 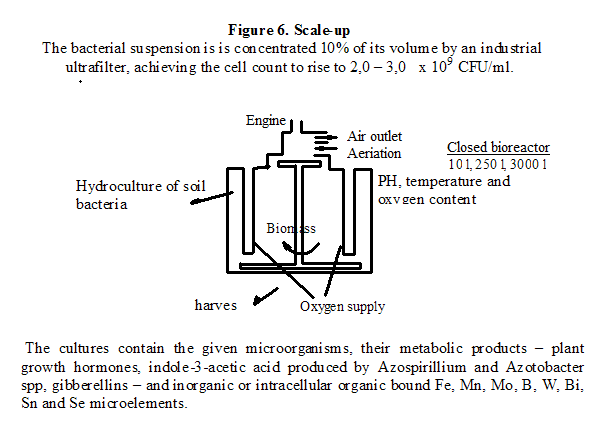 With the adjustments of SSF (solid state fermentation), culturing conditions and equipment, the process (applied for a patent in dec 2007 under the No. P 0700816) is suitable for the culturing and maintenance of microaerophile (requiring oxygen in a low concentration) bacteria. The obtained cultures are favorably applicable for agricultural purposes, as – in oppose to liquid state preparations – solid state preparations have a longer shelf-life, a much higher cell count meaning a considerably lower amount to be inoculated thus minimising the costs of transport and dispersion. The project is financially supported by GVOP – 3.3.3 – 05/1.-2005-05-0034/3.0 grants. 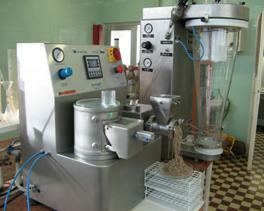 Granulation and pelleting aims at the development of the powder-form soil inoculant (Figure 5.) to expand the areas of applicability (dispersing granulate on arable land) and elongate shelf-life of bacterial strains. Stability of cells are most simply achieved by means of bonding to a carrier. Adsorption on a solid carrier or mixing with solid components facilitates transport and loading of the product yet implies a stress factor for bacteria. Hence, it is of great importance to work out the optimal composition of formulation in which the inoculant microorganisms preserve their proliferation capacity. The project is financially supported by grants from the Jedlik Programme (SANI2007). 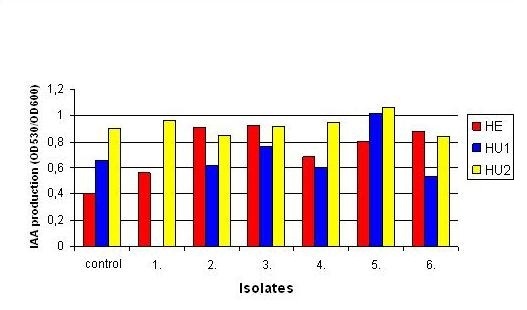 We are also working on the elaboration of a concentration technology and the industrial scale production and utilization of high-efficiency Azospirillum soil inoculant strains (Figure. 6.) (MBK-SZBK Patent application P 0900248). We are also dealing with the screening and development of microbes capable of the decomposition of policyclic aromatic hydrocarbons (PAH) in order to enhance microbiological and soil enzyme activity of oil ooze and promote recultivation. The infrastructure of the enterprise provides appropriate technical background to R&D activities, including microbiological, technology-development and DNA laboratory and a semi-industrial fermentation system. Developed products and strains are not modified genetically, they serve sustinable, environmentally friendly and organic production in both small and large scales. The selected inoculant strains are transferred to patent deposits (NCAIM), strains and technologies are patent protected. R&D results are directly utilized by partner enterprises (BioFil Ltd., Fermentia Ltd., AgroBio Ltd.) in the form of commercially available products. Centre for Agricultural and Technological Sciences of the University of Debrecen, Szent István University Faculty of Agricultural and Environmental Sciences, Faculty of Veterinary Science, Eötvös Lóránd University Faculty of Science Department of Microbiology, Agricultural Biotechnology Center; Forestry Research Institute, Zvolen, (SK); Research Institute of Organic Agriculture (FIBL), Department of Perennial Crop Production, (CH). J. Kutasi, I. Puspán, É. Kárpáti (2009) Improvement of cold stress tolerant Azospirillum brasilense strains for effective soil inoculation. Acta Microbiol. Immunol. Hung. 56:61.I. Puspán, R. Kovács, É. Kárpáti, J. Kutasi (2009) New feature of Micrococcus roseus soil inoculant bacterium: highly effective indole-3 acetic acid production. Acta Microbiol. Immunol. Hung. 56:228.